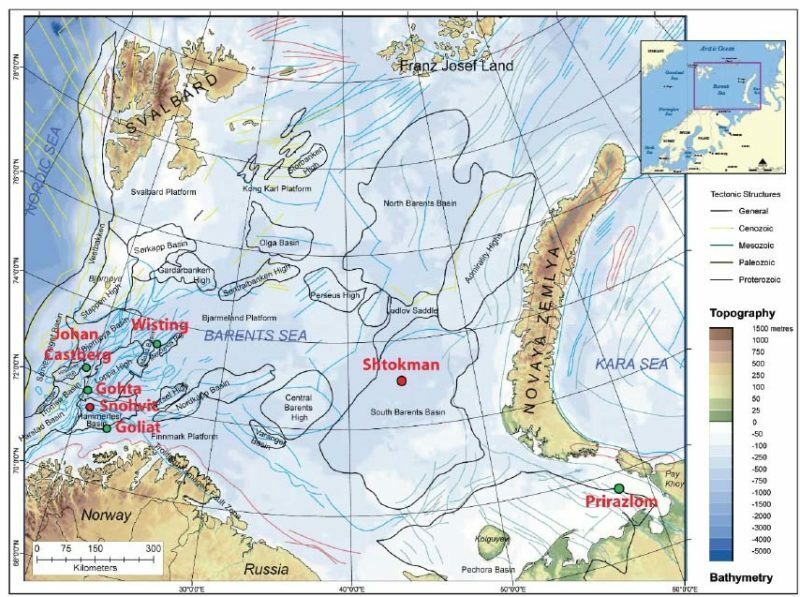 The Norwegian Petroleum Directorate (NPD) has received applications from 39 companies for new acreage in mature areas on the Norwegian Continental Shelf, including the largest ever offering of acreage in the Barents Sea. Statoil and partners have also announced three Barents Sea discoveries in 2017: Kayak, Blamann, and Gemini North. The Barents Sea is a challenging environment due to harsh Arctic environmental conditions and minimal existing infrastructure. To be economic means that new discoveries must be jointly developed, or stand-alone developments will need to be larger than those in the North Sea or the Norwegian Sea to be profitable. So, what are the proven plays in the Barents Sea and based on an assessment of applicable global reservoir analogs, do these merit the investment risks? The principal Barents Sea discoveries are listed in Figure 1 and Table 1, with their primary play elements captured using C&C Reservoirs’ proprietary classification system. The use of a consistent classification is essential to identify a relevant population of global reservoir analogs. These can be used for benchmarking, calibrating uncertainty ranges and validating development assumptions. Reservoir analogs marry a knowledge of the geological characteristics with the development decisions that have resulted in the observed production performance. As seen in Table 1 the most significant play in the Barents Sea is the Jurassic Stø clastic play which will be the focus of this analysis. The Stø clastic play has limited production history in the Barents and therefore valuable insight can be gained by identifying applicable global reservoir analogs using the Frequency Search algorithm in DAKS. This workflow requires, firstly, loading the target parameters for the Stø play. Secondly, defining a parameter search range for each of the target parameters. The Frequency Search algorithm uses these ranges to automatically identify all reservoir analogs that fall within one or more of the parameter ranges. A summary histogram can be produced quickly and shows how many, and which, Stø parameters, each reservoir analog matches (Figure 2). The identified analog population can be further filtered to assess those reservoir analogs that dominantly match the geological, engineering or fluid parameters of the Stø play. Analogs are used to solve specific problems and the population of applicable global reservoir analogs can be adjusted to suit the nature of the problem. Figure 2 – Frequency Search histogram results. Green bars are the selected reservoir analogs. The chart line labeled At Least means the reservoir analog will match this number of parameters and more. The bars labeled Exactly means the analog reservoir matches only that number of parameters. The results in this note combine the assessment of a number of Norwegian discoveries, with subtly different play controls, into one analog search algorithm, for brevity. The Frequency Search algorithm has identified 227 applicable global reservoir analogs (Figure 2) that match at least 8 of the defined search parameters. The focus of this search has been on geological parameters. Typically, fluid and engineering parameters would be added to refine the search and to conduct a more detailed analysis at the individual prospect or field level. To guide my exploration campaign in the Barents Sea, what are the most likely trapping mechanisms observed in the analog plays? To calibrate uncertainty for the parameters required to calculate a probabilistic resource volume; what are the range of field average values for each parameter in the analog population? Figure 3 – Location of the 227 applicable global reservoir analogs for the Barents Sea Jurassic Stø play. What are the most likely trapping mechanisms observed in the analog plays? To better address these questions for the Stø play, the 227 reservoir analogs have been further refined to be those that match at least 8 parameters and have a shoreline-shelf depositional environment in a rift tectonic setting. This results in a subset of 54 from the 227 displayed. From this population, the most comparable proven play analogs to the Stø play are: Latrobe play (Gippsland Basin, Australia), Plover play (Bonaparte Basin, Australia / Indonesia), Ben Nevis play (Jeanne d’Arc Basin, Canada), and the Fulmar play (North Sea, UK / Norway). To address question 1, the population of analogs highlights 14 different Trapping Mechanism (Main) classes, with tilted fault block and paleostructure subcrop traps dominating (Figure 4). These should be contrasted against the proven discoveries in the basin through an assessment of the DAKS Field Evaluation Reports (Figure 5). Figure 4 – Trapping Mechanisms in the analog population. DAKS IQ classification infographics shown for the top two. Figure 5 – Structural geoseismic sections across proximal field analogs Wisting, Snohvit and Albatross discoveries. Figure 6 – Geological parameter ranges and benchmarking of Reservoir Thickness, Net/Gross, Net pay, Porosity and Initial Water Saturation. To address question 2, the uncertainty ranges for each of the geological parameters included in a probabilistic volumetric calculation are calibrated using the analog knowledge base. Benchmarking the estimated parameter ranges from proximal wells, against those observed in the analog population is a proven technique to calibrate uncertainty. In the characterization table (Figure 6) the analog population highlights that the assumed initial water saturation is relatively high, whilst other parameters are within the ranges observed in the relevant analogs (indicated in the Rank column). Recovery factors from the analog population can also be quickly assessed. The production profiles for this population of analogs show that many have ramped-up production quickly and sustained plateau rates (Figure 7). All of which would support investment returns in the event of a discovery. Contrast this, for example, with fractured carbonate plays that often require numerous wells before the optimal development well design is discovered, which delays production revenue. The Barents Sea has a number of proven plays and the potential to be a significant hydrocarbon province. Within this harsh Arctic environment, the chance of uneconomic discoveries is higher and managing uncertainty ahead of drilling dry holes will be critical to economic success. 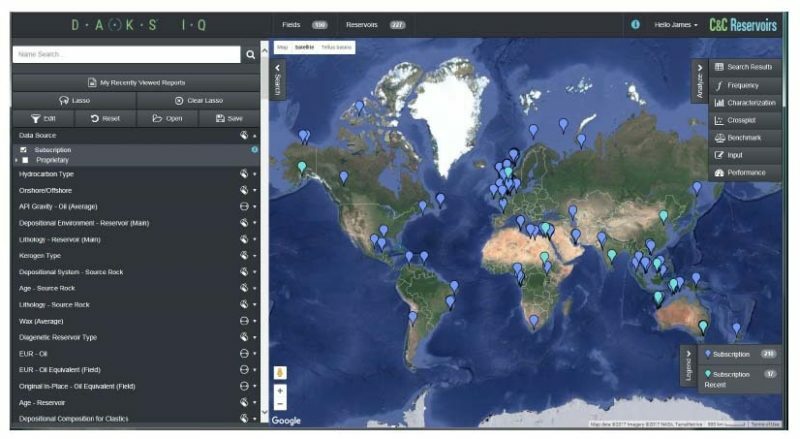 Four global play analogs and 54 reservoir analogs have been quickly identified using DAKS, many of which have long production histories. The combination of detailed play and reservoir descriptions, coupled with a knowledge of the development decisions that have driven the production performance, is valuable in calibrating geological parameters and validating development scenarios. Learning from the experience of others will help focus future exploration campaigns in the Barents Sea and help it become a significant hydrocarbon province.